The last firefly tour was spectacular! Hundreds of fireflies glittering their magic through the forest. We saw a swamp wallaby and heard the Peron’s tree frog chorus. I always love the ‘hush’ that falls over the group when we first see the fireflies, it really does take your breath away! says Jeannie our Eco Guide. Earlier in the afternoon I had been on a Rainforest walk and spotted a Powerful Owl! In all my years of bushwalking and eco-tours I had never seen one in the wild before. It was exhilarating. You never quite know what you will find in the Australian Rainforest Sanctuary & Forest of Tranquility in Ourimbah on the Central Coast!! If you bring your binoculars and visit during the day you may see it too! 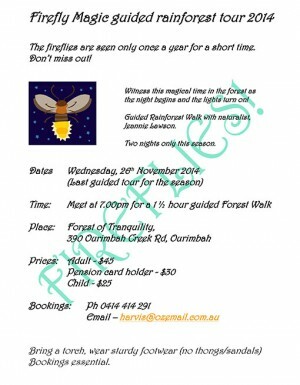 The next Firefly Magic Guided Tour is Wednesday night 26th November 2014. NATURE IS AWESOME! Come and experience it with me! Hope you can join me for a magical experience. Please phone 0414 414 291 to book in. This entry was posted in Firefly season and tagged Fireflies Arrived, firefly magic tour, Firefly Season.